I will give you three reasons Pinterest is an amazing, yet understated tool for writers, and share seven ways you can get the best use possible out of the platform. 1. Traffic: Pinterest is the gift that keeps on giving. While sharing a post on Facebook, Twitter, or Instagram may send readers your way for a couple of days, Pinterest can send readers your way years later. How? Pinterest is a search engine. You may have written a blog post, or posted a picture of your book a year ago, and Pinterest will still send hundreds, or even thousands, of page views a month your way. This means people are going to be finding your site, and then hopefully, staying on your site, browsing other posts, visiting your about me page, and possibly buying a book with very little effort on your part. 2. Sell Your Books: With a business account, (more on that later) you can make your Pin a buyable one, and people can buy your book without leaving Pinterest. This can be a fantastic tool for authors who utilize BigCommerce, Salesforce Commerce Cloud, or Shopify as additional platforms to sell their books. Of course, if you don’t use these platforms, you can still use Pinterest to promote your book and send potential readers to a book synopsis page that has a clickable Amazon link. You can find out more information here. 3. Research: Pinterest is a gold mine for writers! Need help writing a query letter, starting an author platform, or crafting a relatable character? Search Pinterest. Do you want to get to know your character on a deeper level? Create a character inspiration board and Pin things related to your character’s MBTI personality type, physical description, favorite songs, fashion, hairstyle, and hobbies. Not inspired to write? Create a mood board for your book. Pin things related to what you’re writing such as light romantic things for romance and terrifying things for horror. Need help setting the scene or building a world? Create a Pinterest board that has world-building tips and strategies, as well as pins that relate to your world’s culture, laws, fashion, flora, or architecture. How Can You Use Pinterest to the Fullest? 1. Create a Pinterest Business Account: This is an extremely important FREE step. You set this up in settings, and it provides free analytics for your pins, allows you to advertise your pins, and sets you up to enable Rich Pins. 2. Enable Rich Pins: Rich Pins make the posts you Pin stand out and its free to get. They show extra information for each Pin such as a headline, the author’s name, a short description, and the price, if there is one. The also give your readers confidence that your site is legit, and distinguish you from the other Pinners out there. You can find out more information here. 3. Blog About Writing Tips: As a writer, you’ve probably use Pinterest to find helpful and valuable writing, editing, and publishing tips. Have you picked up any tips on your own? Blog about them and then Pin them on Pinterest. People want to know how to use Scrivener, how to write a bestseller, how to edit their book, how to write relatable characters, and other things. If you consider yourself an expert on any of these things, blog about them, and Pin them. 4. Engage With Your Readers: Are you currently writing a book? Have you already published a book? Create a book board, a character board, or a setting board. Pin images that describe your book or character’s aesthetic. You can also create other boards such as an inspirational quotes board, a writing tips board, or a favorite book/author board. 7. 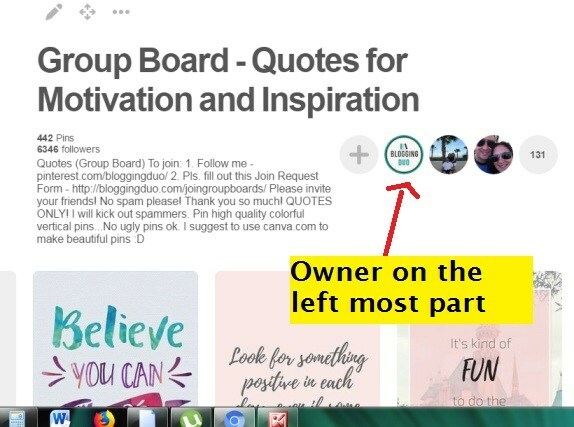 Join Group Boards: Group boards are multiple collaborators coming together to Pin things related to a common theme. It’s a quick way to get exposure and increase your traffic. Anytime you post your pins to that board, anyone following that board can see your Pin. Sometimes, this means thousands of people are seeing your Pin every single day. Need help finding group boards? I recommend using PinGroupie. It makes it easy to find group boards with several contributors and tons of followers. Most group boards have directions for joining in the description. If not, click on the first profile picture you see under the board, and send them a message asking if you can join their board. Don’t be scared! The majority are friendly and would love for you to join their group board. Was this article helpful? Do you think Pinterest can work for you?Are you already finding a lot of success using it? Do you need me to explain something in a little more detail? Leave a comment down below!